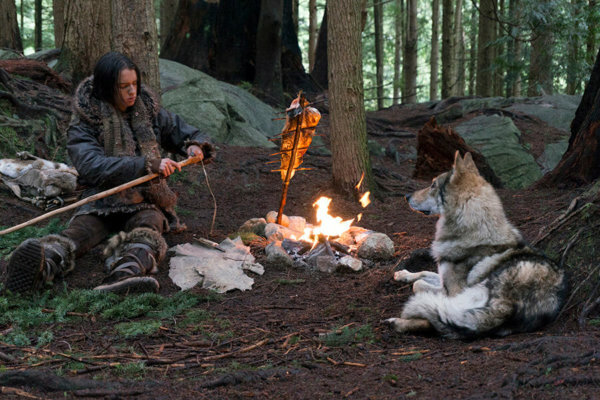 NEW YORK (CNS) — The oft-repeated tale of a boy and his dog is as old as time — or at least the last Ice Age, the intriguing setting for “Alpha” (Columbia). Director Albert Hughes, working from his own story, imagines how mankind discovered man’s best friend — its canine ancestor, the wolf — some 20,000 years ago in southern Europe. He immerses the viewer in an extraordinarily vivid tableau, a primeval world where Cro-Magnon families struggled to survive against apocalyptic weather and savage creatures. Adding to the realism, everyone speaks Cro-Magnon (or at least Hughes’ best guess), with English subtitles. The result is a thrilling fable, a coming-of-age survival story about family and friendship that, despite a few perilous moments, is worthy viewing for older teens. Tau, leader of the tribe, is anxious that his son succeeds. “Prove you can lead. Find your strength,” he says. “Life is for the strong. It is earned, not given.” Prophetic words for the sensitive boy. Fear gets the better of Keda during the hunt, when he is struck by a rogue buffalo and tossed over a cliff. Tau, devastated, must accept that his beloved son is lost, and leads the tribe back home. Keda, however, has survived (this is a fantasy, after all). Despite a broken ankle and hungry predators at every turn, he is determined to find his way home. One day, a pack of wolves attacks. Keda escapes, but the lead wolf (the “Alpha”) is injured and left behind. Keda hasn’t the heart to kill the beast and decides to nurse its wounds. It’s not hard to predict what happens next, as the natural enemies become friends and embark on an incredible journey. In this sense, “Alpha” is an old-fashioned adventure story worthy of Jack London, one that thrills the senses and warms the heart, Ice Age or not.